The Resort at Longboat Key Club in Sarasota, Fla., boasts a world-class tennis facility that features 20 hard courts. End your day with rounds on one of two fantastic golf courses. With that other U.S. Open underway this week—you know, the one that isn’t played on grass—we’ll excuse you if your thoughts have wandered from putting strokes to ground strokes. Fortunately for devotees of golf and tennis, there are plenty of resorts across the land that cater to both pursuits. If you love smashing overheads as much as you do tee shots, these 10 properties are winners. Fisher Island Club, Fisher Island, Fla.
Grass. Clay. Hard court. Take your pick of three different playing surfaces at this Miami tennis hotbed, which has 18 courts, including a center court with stepped up viewing areas. Good thing for spectators, given Anna Kournikova, among other pros, has been known to train here. The Links at Fisher Island is ultra-exclusive, but resort guests can play here, too. Pebble Beach Resorts, Pebble Beach, Calif.
You know all about the courses—Pebble (pictured), Spyglass Hill, Spanish Bay, et al.—but what about the courts? There are a dozen at the resort's Beach and Tennis Club, just beside The Lodge, including a spectacular sunken center court that draws tournaments year-round. And over at Spanish Bay you'll find eight more courts. Resort guests enjoy access to all of the tennis-related amenities, ranging from children’s programs to group and private lessons. 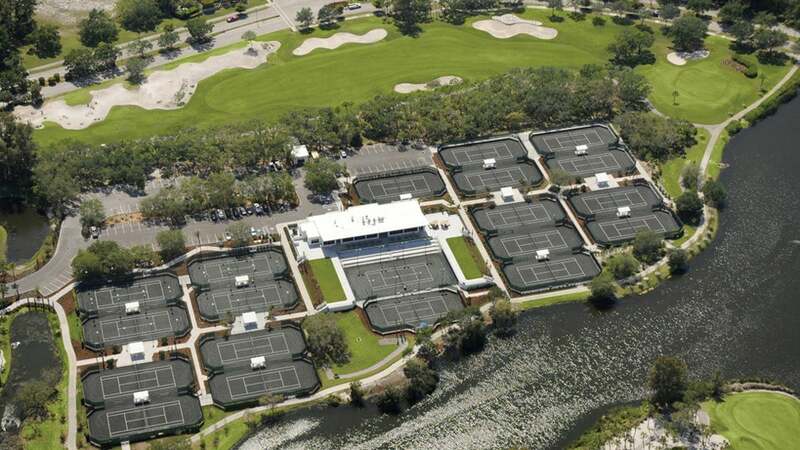 The Resort at Longboat Key Club, Sarasota, Fla.
United States Tennis Association members get discounted room rates and complimentary breakfasts, and every guest gets access to the Tennis Gardens, a world-class facility that features 20 hard courts, ringed by lush Florida greenery. After your court time, pick from two courses: The Harbourside course runs along Sarasota Bay, while the Islandside course buffers the Gulf of Mexico. Rancho Valencia, Rancho Santa Fe, Calif.
Citrus groves and bouganvillea provide the tranquil backdrop for 18 plexi-pave tennis courts and this San Diego area resort. The sport is so central to the property that guests can book a stay-and-play tennis package that includes one night in a luxe casita and a $175 tennis credit. There’s no course on property, but the concierge will happily help you arrange tee times at all the area’s top tracks, from Torrey Pines to La Costa. Aside from all the golf that you can eat—including the mighty, meaty Ocean Course (pictured)—Kiawah has two state-of-the-art tennis complexes on a 10-mile island. That’s 20 hard courts altogether, two of them lighted for nighttime play. Tennis-related perks include a matchmaking service to pair you with a player of your level. Tennisresortonline.com rated Kiawah as the second-best tennis resort in the world. When the mercury drops, the tennis action heats up at this mountain resort, which has six courts, two of them protected by an illuminated heated bubble for year-round play. During the summer, complimentary afternoon round robins are the perfect way to meet other tennis guests. Test your other strokes on the resort’s historic East course, which has played host to two U.S. Women’s Opens and a pair of U.S. Amateurs. Wequassett Resort and Golf Club, Harwich, Mass. The embodiment of Cape Cod quaint, this upscale hideaway has two swimming pools, ready access to two pristine beaches, and four green clay courts at the chic center of it all. Guests enjoy access to nearby private Cape Cod National (pictured). Daily clinics, weekly socials and casual round robins are all part of the program at this high-altitude resort, which as 17 hard courts and a range of summertime specialty programs, including cardio tennis workouts with a ball machine. The scenic Robert Trent Jones Jr.-designed Trail Creek course serves up 360-degree views of the Wood River Valley. Relax. You’re in Hawaii. The tennis isn’t U.S. Open tough. It’s played, instead, on eight polyurethane rubber courts with plenty of cushion. Two of the courts are lighted for nighttime play, and all of them come with complimentary water, sports drinks and towels. Chill, catch a good night's sleep, then go smash some more balls—on the Jack Nicklaus Hualalai course, which winds it way through black lava. All right, so it's not a resort, but how’s this for a pairing? Two U.S. Open venues in a single day. It’ll take some planning, but you can pull it off. Start with a round at Bethpage Black, then hustle over to the Billie Jean King National Tennis Center (a 40-minute drive west), which hosts a national championship of a different kind. The facility has 22 courts within its gates, and another 11 in an adjoining park. Though you can’t book time at Arthur Ashe Stadium, the site of the U.S. Open tennis finals, the satellite courts are available for reservation up to two days in advance.